MEXICO CITY - In a scheme befitting a crime novel, Mexico's most powerful drug lord, Joaquin "El Chapo" Guzman, escaped from a maximum security prison through a 1 mile tunnel that opened into the shower area of his cell, the country's top security official announced Sunday. The elaborate, ventilated escape hatch built allegedly without the detection of authorities allowed Guzman to do what Mexican officials promised would never happen after his re-capture last year - slip out of one of the country's most secure penitentiaries for the second time. CBS News correspondent Bill Whitaker reports Guzman was the first Mexican drug trafficker to hire architects and engineers to build elaborate tunnels, complete with railways, to ferry drugs under the U.S.-Mexico border and he spent millions adapting them to use as escape routes from his many hideouts. Eighteen employees from various part of the Altiplano prison 55 miles west of Mexico City have been taken in for questioning, Security Commissioner Monte Alejandro Rubido said in a news conference without answering questions. A manhunt began immediately late Saturday for the head of the powerful Sinaloa Cartel, which has an international reach and is believed to control most of the major crossing points for drugs at the U.S. border with Mexico. Associated Press journalists near the Altiplano saw the roads were being heavily patrolled by Federal Police with numerous checkpoints and a Blackhawk helicopter flying overhead. Flights were also suspended at Toluca airport near the penitentiary in the State of Mexico, and civil aviation hangars were being searched. Guzman was last seen about 9 p.m. Saturday in the shower area of his cell, according to a statement from the National Security Commission. After a time, he was lost by the prison's security camera surveillance network. Upon checking his cell, authorities found it empty and a 20-by-20-inch hole near the shower. Did the Mexican gov’t protect the Sinaloa cartel? 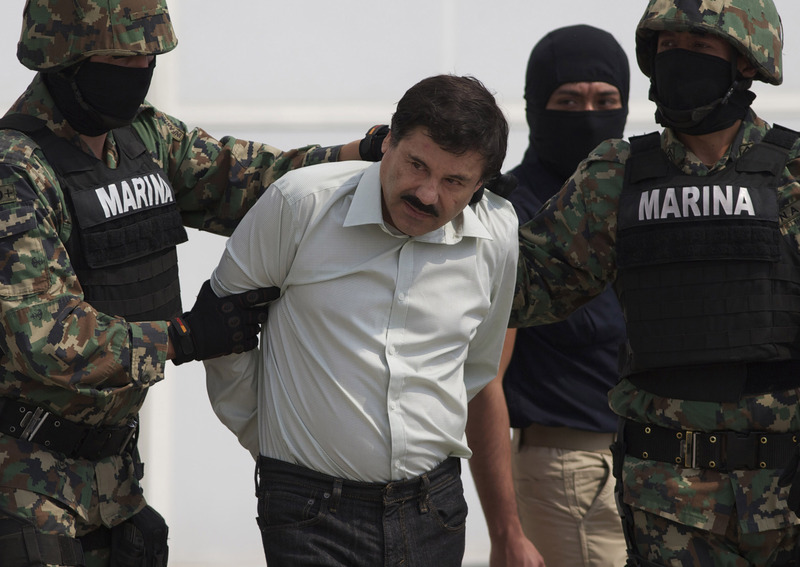 Guzman's escape is a major embarrassment to the administration of President Enrique Pena Nieto, which had received plaudits for its aggressive approach to top drug lords. Since the government took office in late 2012, Mexican authorities have nabbed or killed six of them, including Guzman. Guzman faces multiple federal drug trafficking indictments in the U.S. as well as Mexico, and was on the U.S. Drug Enforcement Administration's most-wanted list. The U.S. has said it would file an extradition request, though it's not clear if that has already happened. American officials have expressed an eagerness to prosecute Guzman for what they believe is an extensive drug running operation across the U.S.
After Guzman was arrested on Feb. 22, 2014, the U.S. said it would file an extradition request, though it's not clear if that happened. The Mexican government at the time vehemently denied the need to extradite Guzman, even as many expressed fears he would escape as he did in 2001 while serving a 20-year sentence in the country's other top-security prison, Puente Grande, in the western state of Jalisco. Former Mexican Attorney General Jesus Murillo Karam told the AP earlier this year that the U.S. would get Guzman in "about 300 or 400 years" after he served time for all his crimes in Mexico. Murillo Karam said sending Guzman to the United States would save Mexico a lot of money, but keeping him was a question of national sovereignty. He dismissed concerns that Guzman could escape a second time. That risk "does not exist," Murillo Karam said. It was difficult to believe that such an elaborate structure could have been built without the detection of authorities. According to Rubido, the tunnel terminated in a house under construction in a neighborhood near the prison. Guzman dropped by ladder into a hole 10 meters (yards) deep that connected with a tunnel about yards high that was fully ventilated. Guzman is known for the elaborate tunnels his cartel has built underneath the Mexico-U.S. border to transport cocaine, methamphetamines and marijuana, with ventilation, lighting and even railcars to easily move products. He was first caught by authorities in Guatemala in 1993, extradited and sentenced to 20 years in prison on drug-trafficking-related charges. Many accounts say he escaped in a laundry cart, although there have been several versions of how he got away. What is clear is that he had help from prison guards, who were prosecuted and convicted. He was re-captured in February 2014 after eluding authorities for days across his home state of Sinaloa, for which the cartel is named. Officials say a cellphone used by one of his aides led to the arrest. He was listed as 56 years old last year, though there are discrepancies in his birth date. During his first stint as a fugitive, Guzman transformed himself from a middling Mexican capo into arguably the most powerful drug trafficker in the world. His fortune grew to be estimated at more than $1 billion, according to Forbes magazine, which listed him among the "World's Most Powerful People" (along with the U.S. Treasury Department) and ranked him above the presidents of France and Venezuela. Guzman has long been known for his ability to pay off local residents and authorities, who would tip him off to operations launched for his capture. He finally was tracked down to a modest beachside high-rise in the Pacific Coast resort city of Mazatlan on Feb. 22, 2014, where he had been hiding with his wife and twin daughters. He was taken in the early morning without a shot fired. But before they reached him, security forces went on a several-day chase through Culiacan, the capital of Sinaloa state. They found houses where Guzman supposedly had been staying with steel-enforced doors and the same kind of lighted, ventilated tunnels that allowed him to escape from a bathroom to an outside drainage ditch. Even with his 2014 capture, Guzman's Sinaloa Cartel empire continues to stretch throughout North America and reaches as far away as Europe and Australia. The cartel has been heavily involved in the bloody drug war that has torn through parts of Mexico for the last decade, taking at least an estimated 100,000 lives. Altiplano, which is considered the main and most secure of Mexico's federal prisons, also houses Zetas drug cartel leader Miguel Angel Trevino, and Edgar Valdes Villarreal, known as "La Barbie," of the Beltran Leyva cartel.